President R. Albert Mohler Jr. leads a dedication ceremony of renovated Mullins Complex, Aug. 19. 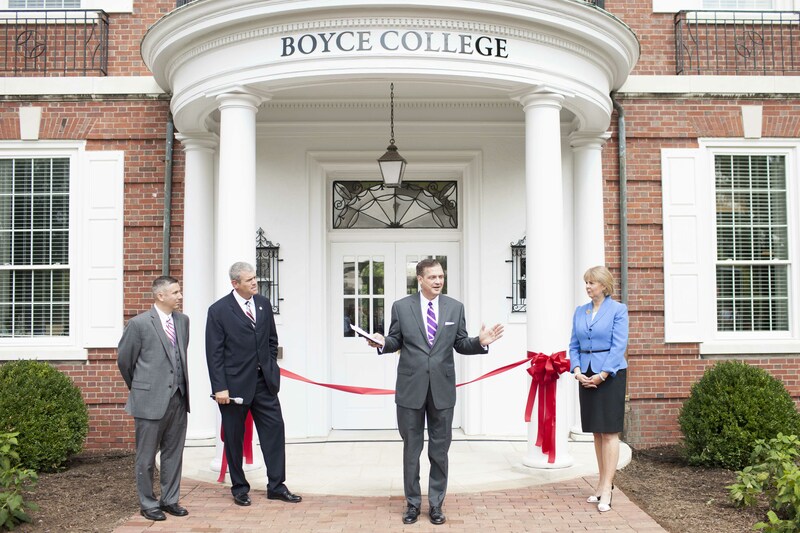 He is joined (left to right) by Dan DeWitt, dean of Boyce College; trustee chairman Philip Gunn, speaker of the Mississippi House of Representatives; and first lady Mary Mohler, who performed the ribbon cutting. 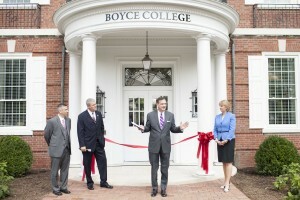 The newly renovated home of Boyce College, the undergraduate school of The Southern Baptist Theological Seminary, was dedicated Aug. 19 in a ceremony led by President R. Albert Mohler Jr.
“This is a day that marks a significant step forward for Southern Seminary and Boyce College and one we celebrate together,” Mohler said. The grand re-opening of the historic Mullins Complex comes after a seven-month project that totally renovated the interior of the 130,000 square-foot, nearly 90-year-old facility. The project was “retrofitted to the needs of college students and a growing, thriving college for the next generation,” he said. Throngs of students, faculty, and trustees convened for the dedication service in Mullins Courtyard. Other seminary officials joining Mohler in the brief ceremony included trustee chairman Philip Gunn, speaker of the Mississippi House of Representatives; Dan DeWitt, dean of Boyce College; Daniel S. Dumas, senior vice president of institutional administration; and first lady Mary Mohler, who performed the ribbon cutting. The event also featured an open house in Sampey Commons and a tour of a model dorm suite. “If you had been in [Mullins] in times past, and you went in it now, you would not know that it was the same building,” Mohler said to the ceremony attendees, which included alumni and other former residents of the complex. The Mullins Complex — comprised of five halls named for major figures in the seminary’s history — is among the oldest group of buildings at Southern Seminary, dating to the 1920s, and over the years served as the seminary’s primary dormitory. The complex has housed major figures in the history of the Southern Baptist Convention like W.A. Criswell, Herschel Hobbs, and others. Messer Construction Co., Louisville office, completed the renovation of the Mullins Complex. The renovation began in December 2013 as part of the $20 million first phase of the seminary’s comprehensive Master Plan. It involved repurposing the historic Mullins Complex as a first-rate college facility, moving Boyce College to the center of campus. Construction workers completely renovated the complex, starting with a demolition process that lasted through the winter and finishing with a comprehensive interior redesign that was completed in July. Boyce enrollment is more than 770, with 260 new students — the largest incoming class to begin a semester at the school, which became the seminary’s undergraduate program in 1998. Students moved into Mullins on Aug. 8. The renovated Mullins Complex is a state-of-the-art facility where Boyce students can live and interact with their community. Students are housed in 86 suites, providing a total of 350 beds with room for expansion. Additionally, the complex includes 17 faculty offices, and disability friendly features have been incorporated throughout the complex. Sampey Commons is a comfortable gathering area for students and their friends, and includes a rock climbing wall, two kitchens, a recording studio, and an entertainment lounge.